Regardless of anything which follows – just know that I love the hell out of this bottle design. 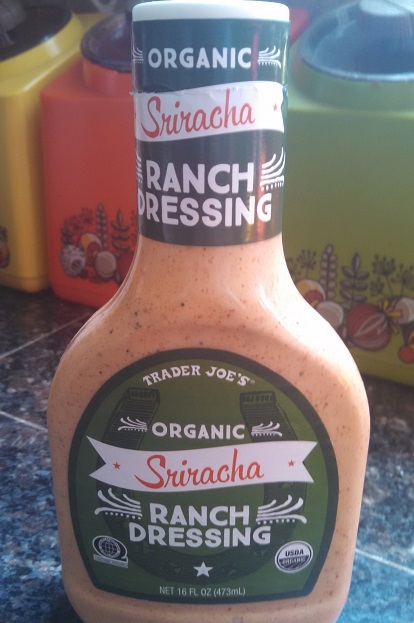 After reviewing Trader Joe’s fantastic new Sweet Sriracha Bacon Jerky the other day, I was more than eager to give Trader Joe’s Organic Sriracha and Roasted Garlic BBQ sauce a shot. Trader Joe’s obviously has it in their mind to revolutionize the sriracha game. Not content deal with the Hoy Fong foods status quo, TJ’s started off by shaking things up with their own brand of tangier sriracha. 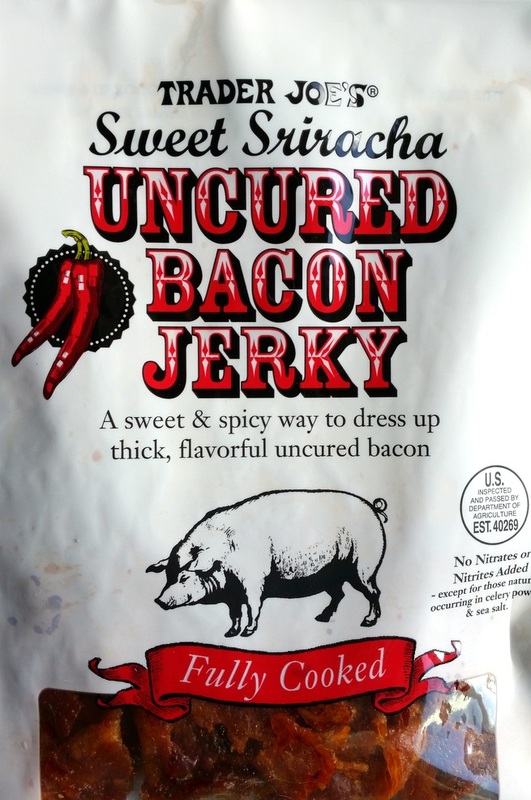 The sweet sriracha bacon jerky escalated things to a whole different level entirely – setting the stage perfectly for an organic, sriracha based BBQ sauce. However, while this BBQ sauce is good, it’s not going to knock your socks off or anything. The first thing I should point out is, despite getting top billing in the name, this sauce doesn’t taste like sriracha at all. Oh, sure, it’s spicy – very pleasantly spicy without being too hot in fact. 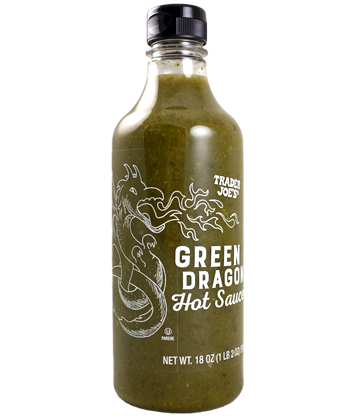 However, that spiciness simply doesn’t have any of the signature fire or tang of sriracha. In this case, it really feels like Trader Joe’s simply decided to replace the generic word “spicy” with a more buzz worthy keyword. The second thing I should point out is that it isn’t really all that garlicky. There is definitley garlic in it, but the garlic is hidden beneath the much stronger flavors of the BBQ sauce, mostly noticeable just as it touches the tongue, then just peaking up around the edges after that. Much stronger than the garlic taste is the sugary sweetness of the sauce. In fact, the sauce is about a third molasses and sugar, so when it comes to the aftertaste there’s not really any zing, just the cloying, lingering aftertaste of syrup. So I praise this BBQ sauce with a caveat. For a BBQ sauce, it really is pretty good – spicy, sweet and bold, with just a subtle hint of garlic to mix things up. 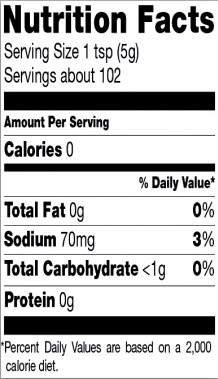 For a “sriracha and garlic” BBQ sauce, however, it doesn’t really deliver on the billing. If you’re looking for a sweet and spicy BBQ sauce, you’re not going to regret picking his one up. 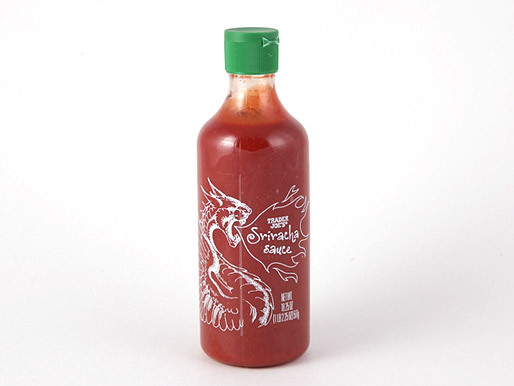 If you’re looking for something with a garlic kick, however, or something that pays homage to the South East Asian fire of real sriracha, you’re probably better off just picking up a bottle of the rooster sauce by itself and whipping up a glaze on your own. Would I Recommend It: I might – it’s a good sweet and spicy sauce, if that’s what you like. Would I Buy It Again: Too sweet for me – I prefer something more like Trader Joes’s Carolina Gold. Final Synopsis: Not much sriracha or garlic, but still a good BBQ sauce.